Part works publications are always a sore point with me. It's not something you can dip in and out of as you'll need every issue to complete what it is you're collecting. 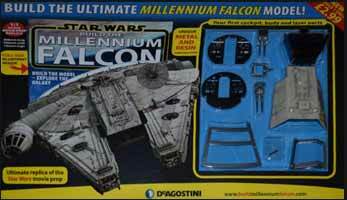 In the case of De Agostini's Build the Millennium Falcon, there are 100 weekly issues (£8.99 each) for you to collect in order to build you spaceship. Also, there's always the worry that lack of consumer interest will see the publication shut down before it's run its course. Thankfully De Agostini have a proven track record with these sort of publications. You'll need quite a bit of room to store this as it's a 1:1 scale model of the original The Empire Strikes Back movie prop. It measures 808mm long, 596mm wide and 192mm high and weighs around 11kg when fully assembled. It also requires 6 AA batteries or external 9V adaptor (sold separately). You'll need somewhere you can store the parts as you work on them each week (you'll want to check over the pieces as they arrive in case any are faulty or you damage any of them and need to pick up another issue. What's interesting is that the first issue includes blue prints that are actually of a 1:1 scale, so you can unfold these and check whether the area you have allocated for your finished model is big enough. 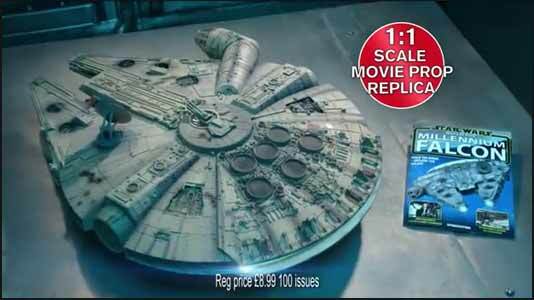 Each weekly part comes with a glossy full colour 16 page magazine which gives you background on the Millennium Falcon. The magazine also shows you where each part, you've received that week, goes in the finished model, as well as how to easily assemble them. However, a lot of the parts you'll receive over the weeks can't be assembled until much later so you'll need to ensure that you know where every piece is and with which issue it came with, otherwise you could find yourself with a difficult puzzle in the later stages of the ship's construction. The model includes pre-painted hull parts, removable panels, working electronics for the moving ramp, LED lighting, and many internal details including the famous dejarik hologame table. With a die cast metal and highly detailed resin construction, the completed model is designed for Star Wars fans and model makers. The only other comparable model previously available was from Master Replicas Inc. as a pre-assembled model at a significantly higher price. The De Agostini model also has internal features which the Master Replicas model did not have. Subscribers also receive a limited edition T-shirt, a Han Solo figurine, an exclusive binder for keeping the magazine safe and a display stand to show the model off to best effect. And you have the option of downloading the magazine content to your iPad or Android device. The only slight downside to this is that, is that to collect the entire series (of 100 issues) is going to set you back just shy of £900. But then I suppose that's under £40 a month (£35.96) and if you're a Star Wars fan you'll just treat it as a new construction based hobby for the year. To be fair, price issues aside, if you're a dad, with a young child who is about to get their first taste of Star Wars with the latest batch of movies due to be released, this will make a great bonding project that you can do together.